NOTE: the OCs in the balloon are temporary until it's revealed just who they are! I apologize if you think that that little detail somehow makes this entire project worthless but I am not going to use "Al Capony" (an OC creation by Ponychan's team) since it's their guy and it's still an OC. If it really irks you that much, we would be more than happy to upload a version with an empty basket instead. 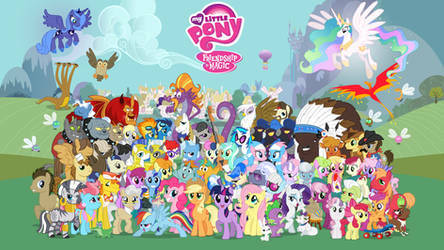 When the ComicCon My Little Pony : Friendship is Magic poster was first revealed, I knew right away that I wanted to recreate it in high quality vector format. At first I thought just a couple people could handle it, so I asked to assist in the project. I chose him because I knew he made good quality images, is a fast worker, and is reliable - he is the one who helped double the graphics available for the Dash Drives, after all. So off we went, the poster divided between us two. Soon afterward the folks over at Ponychan started discussing doing the same thing and they began work on their own version. At first, MaximillianVeers and I continued to work on our own to keep it simple. However, we soon realized that in order to finish ours before Ponychan finished theirs, we'd have to enlist more help. , , , , and were all brought into the project and assigned chunks of the poster to recreate. After many hours of work we are all extremely pleased to present to you all our vector recreation of the ComicCon Pony Poster! In this account you'll find a couple different versions of the poster - one with all the logos and text, as true to the original poster as we could manage, and another version without all that stuff. There is also a few different sizes to choose from so that you don't have to resize it yourself and lose any quality. If there is a size that you would like to have that isn't in this gallery already, feel free to ask for it! Well, we did it. I can hardly believe it, but it's done, and we did a damn fine job, if I may say so myself. It seems almost surreal now, looking at the final product, that it was only 3 weeks ago that Moongaze came to me and said those innocent little words.... "Lets do this..."
And do it we did. Thanks a major bunch to all the people who helped us, we really could not have done it without you. I never imagined we'd ever actually see the end of that road... but here it is. Hi, I've been trying to reach you regarding the use of your artwork for a charity event. Could you please send me a note when you're available? Thank you. Do you plan on doing this with the Season 2 cast poster? So, who was in the balloon? Or is it still not known? 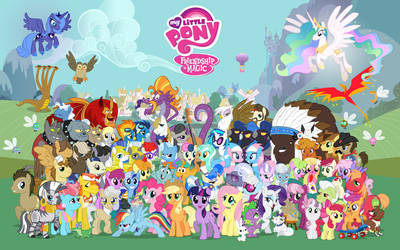 I hope you manage a Comic Con Poster for this season as well considering how many newcomers showed up. You make good Job to get the best sizes. I can not wait for the Comic Con Poster after the second season! Wow, this is certainly quite the work of art. I'd like to use the 30,000px version in a non-profit magazine, are you okay with this? I've been following this epic endeavor since almost the beginning. This really does define "labor of love". I do have one question I hope you can answer for me. Is there a final "gold master" file, preferably SVG, for the diverse posters? No need to rush me an answer if you're busy still tweaking the poster. Thanks for the all the hard work you and the rest put out for this project. I'm looking forward to having a high quality print made for myself. There is no golden master file ATM, nor are there plans to create or release one. We did all the work in Photoshop, which is rather tetchy when it comes to the matter of 30k+ images. Also it doesn't output SVG files.